Advyndra is an osteopathic physician formulated dietary supplement designed specifically for brain and neurotransmitter health. 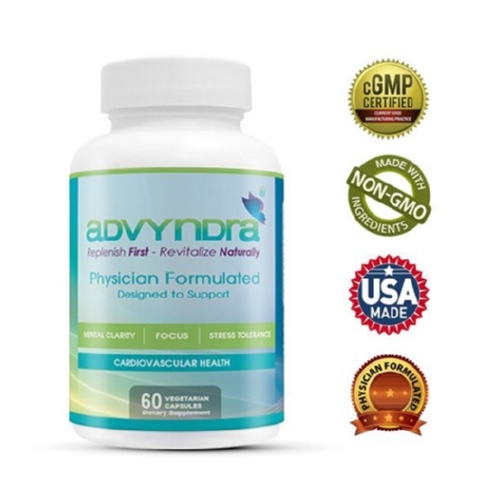 Advyndra unlike competing B complex supplements, contains the active (methylated) forms of Vitamins B 6, 9 and 12 combined with the acetylated amino acid, L- Tyrosine, to support improved focus, mental clarity, mood, and your ability to handle daily stress. Research supports that healthy levels of the neurotransmitter serotonin, dopamine, and norepinephrine are important to achieve optimal brain function. Dr. Hawkins DO formulate Advyndra to support neurotransmitter synthesis, healthy homocysteine levels and methylation. Deficiencies in any or all of these may lead to neurotoxicity and chronic brain inflammation associated with various central nervous system disorders. Also supports healthy homocysteine levels. Elevated homocysteine is linked to atherosclerosis (hardening of the cardiac arteries). Supplement Summary: Supports Neurotransmitter production, Enhance Mental Sharpness, Supports Memory & Mood, Improves Stress Tolerance, No sexual side effects, No Weight Gain, Vegetarian Capsules, Benefits within 4 to 7 days with 2 capsules per day. Directions: As a dietary supplement, take 1 or 2 tablets, every morning on an empty stomach. If preferable, capsule may be opened by holding each end twisting in opposite directions. Separate capsule halves and add powdered contents to juice or tea. Caution: Avoid consumption with energy drinks or other energy enhancing products.